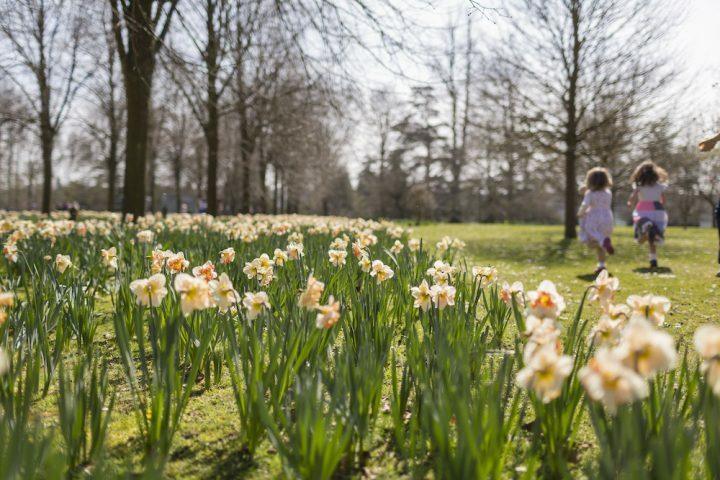 One of the bits of my job that I love most is bombing around Surrey every week, checking out anything that sounds interesting, cool or properly different. When I find somewhere that’s all three, I pretty much combust. So it’s *ka-boom* to May and Grace in Haslemere – because frankly I didn’t see this one coming. 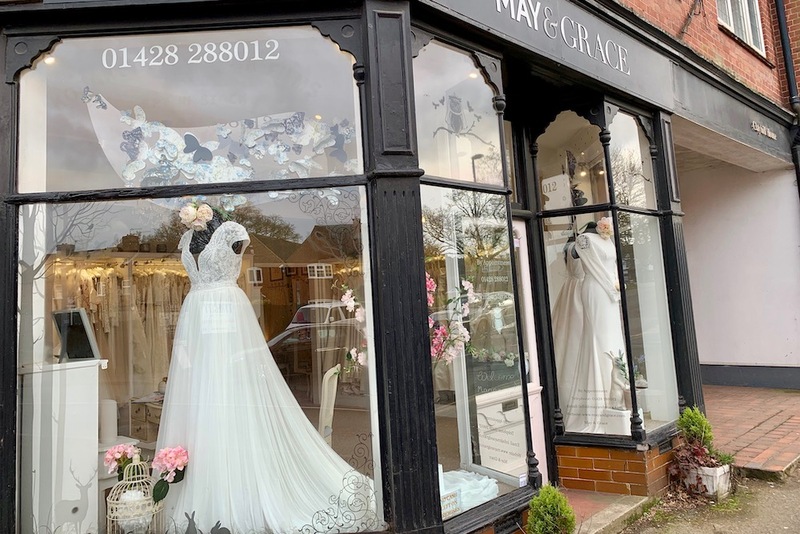 Just out of central Haslemere, in pretty Wey Hill, May and Grace is in a stunning boutique for brides in-the-know. May and Grace has been open for only two years, moving in to the premises where the former Bridal Boutique was for almost 30 years. 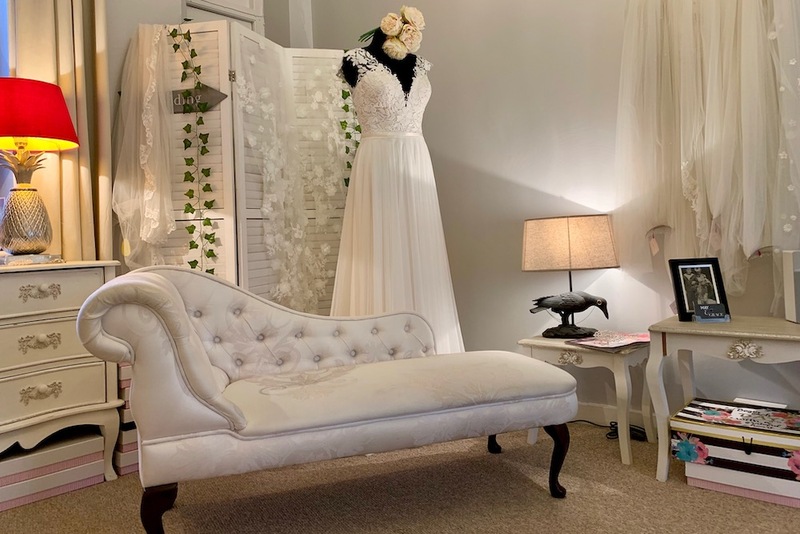 It’s a romantic and whimsical boutique that caters solely to brides – if you’re not feeling the wedding vibe before you arrive, you most certainly will be when you leave. 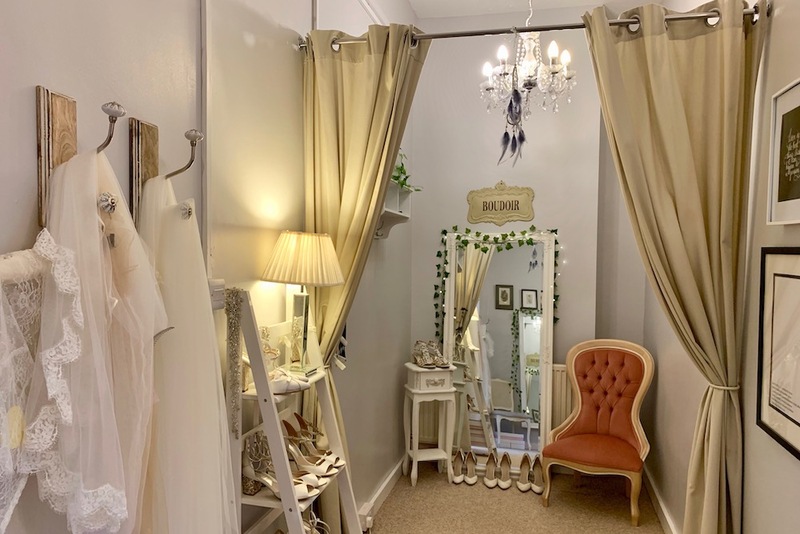 Owned and run by former fashion designer Emilie Crease, the boutique has a highly curated collection of bridal gowns from five hand-picked designers. This is a fashion forward bridal boutique with a cool sense of fun. And Emilie has put together a collection of gowns which reflects the fun – gowns that are a little different and unique. 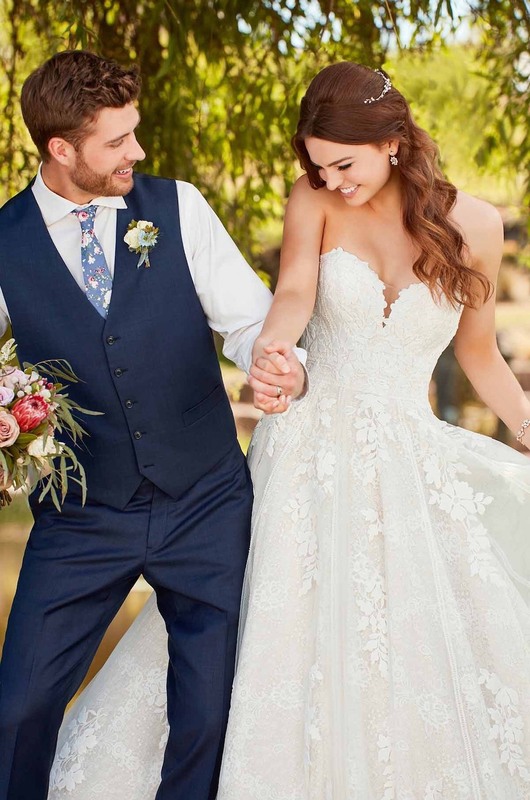 The boutique describes itself as catering for the ‘fashion forward brides’ and there’s no doubt these stunning gowns deftly swerve meringue territory. Seriously, how beautiful are these dresses? Emilie collection is taken from five labels – some carefully selected by well-known and popular labels like Essense of Australia, which produces vintage inspired lace gowns, and others that you won’t find in every bridal boutique, such as Canadian label, Mikaella by Paloma Blanca. These are modern and sophisticated dresses with a twist, an element of fun, and that, alongside the stunning handmade lace that features on many of the designs, makes these dressed truly to-die-for. Zetterberg Couture is a Swedish label that offers a more casual wedding dress choice, and the option of putting together separates to create your wedding-day outfit. The designs are unstructured, fun and sometimes a little off-beat. They’re ideal for destination weddings or brides getting married for a second time. 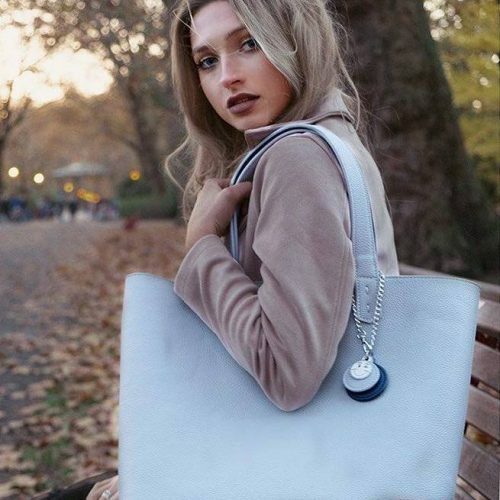 The bold designs of Savin London are handmade in London – and these are made for the bride who wants to own her wedding day, the confident bride who wants to stand out. The newest label to grace the rails at May and Grace is Rosa Clara Couture – elegant, alluring and sophisticated – and all handmade in Barcelona. When I got married – all those years ago – I eloped, so it was just Mr M and me! I didn’t even wear a wedding dress, but rather a trouser suit (and it wasn’t in ‘bridal’ colours). So maybe that’s why I was swooning over every dress in the May and Grace. I seriously don’t think there’s one dress I wouldn’t have loved to have worn. Emilie’s selection is a testament to her trained fashion eye. 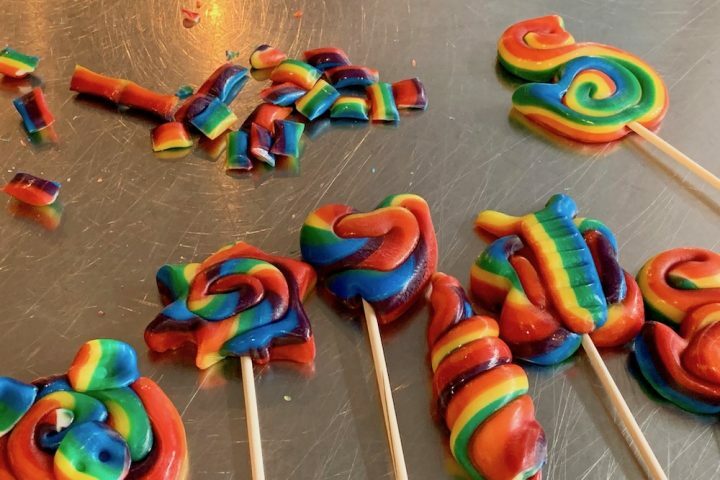 May and Grace caters only to brides and there are no plans to extend this remit to bridesmaids or mothers-of-the-bride, so if you’re hoping to sort everything in one shop this isn’t for you. And if you’re thinking these designs don’t come cheap, you might actually be surprised – dresses start at £1,000 and go up to £4,500. Most sit at the £1,600 mark. 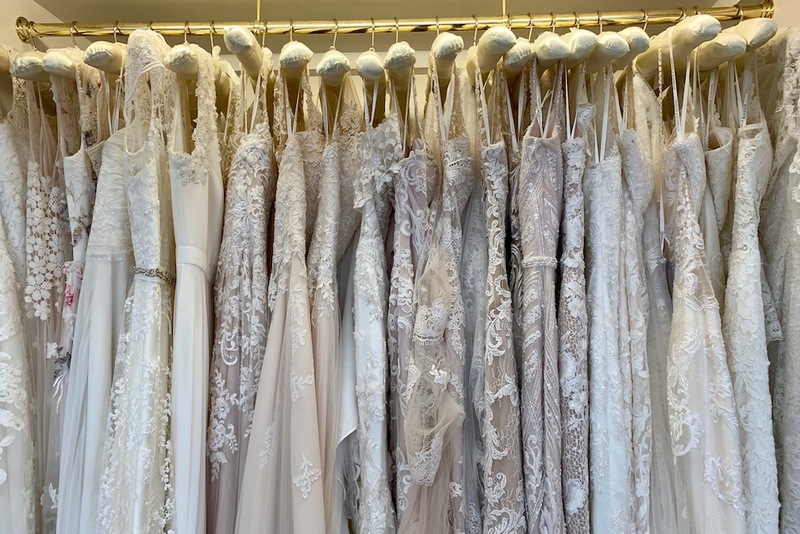 Each bride who visits May and Grace – by appointment only – will have exclusive use of the boutique for an hour and a half, and Emilie’s experience to help narrow down the choices. She spends time talking through your likes and dislikes, but is also pretty adept at determining your style. Emilie also stocks a range of bridal shoes, veils and a small range of accessories like hair pins and earrings. The whole bridal shopping experience at May and Grace is going to make any bride feel super special – and frankly, that’s what you want as a bride-to-be.